On today's show, Mark talks with Chris Beatty about New Fantasyland and Danielle Duffy about the Art of Animation Resort, then Mike and Mark discuss each topic. Thanks for supporting Mark's March of Dimes campaign! Thanks so much for your kind support of Mark's fundraising walk for the March of Dimes! MouseStation listeners and MousePlanet readers accounted for more than half of the over $4,000 Mark raised this year! You can still donate at Mark's fundraising page if you'd like to help us to provide a better chance to prevent prematurity and to help those babies that are born prematurely! Mark will be walking again next year. Look for you chances to join him on Team MousePlanet! Click to follow along with an oversized image of the New Fantasyland. Chris Beatty continually referred to this image during the behind-the-wall discussion. Image © Disney. Chris talked about how the new castle courtyard wall will divide the Castle Courtyard (current Fantasyland) with the Fantasyland Forest (the expansion). While the existing area will remain pristine and fantasy-like, the new area will be more rustic and somewhat overgrown with vegetation. Next was a description of the Seven Dwarfs Mine Coaster, what the ride will be like and how the attraction's mountain will create sightlines of discovery throughout the new area. Next up was a description of the facade, queue, and attraction for Under the Sea: Voyage of The Little Mermaid. He then moved on to Belle's Village, Beast's Castle, and Maurice's Cottage, as well as the Be Our Guest Restaurant and Enchanted Tales with Belle meet-and-greet/attraction. Walt Disney Imagineers Chris Kelly and Tim Warzecha provide an inside look at the creation of the chandeliers in the "Ballroom" dining room of the Be Our Guest Restaurant, which Chris Beatty discussed behind the construction wall. Next up was a quick question-and-answer session. You may recognize voices of some other Disney Internet personalities asking some of the questions. Our last interview with Chris was recorded in November and ran in December. 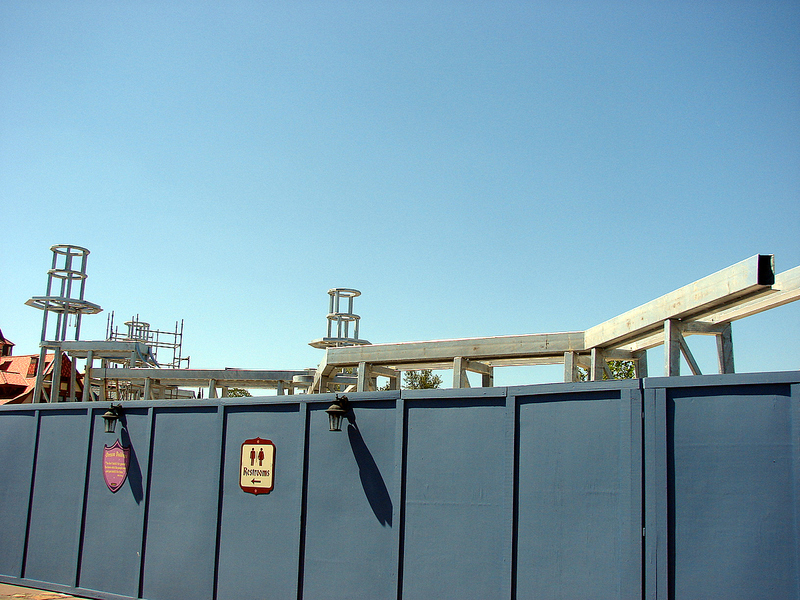 Mark and Chris talked about the steel going up on mine train and the scaffolding coming down around the construction site. Chris talked about how guest comfort was a big concept in the design of the land and how it will provide something that was lacking in the park. It is amazing how quickly the new courtyard wall is going up, and it should look like it was always there when it's done. 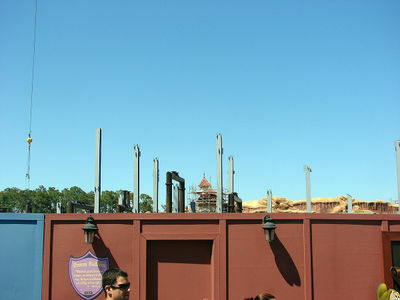 Structural steel for the castle courtyard walls continues to take shape. Photo by Mark Goldhaber. The basin of the old 20,000 Leagues Under the Sea really helped them to go down without having to worry about the Utilidors, and there will be some places where guests will be able to look down into the coaster. The mountain for the mine train will provide the "sense of reveal" as you work your way around the new spaces. Steel continues to go up for the Seven Dwarfs Mine Train coaster. The grey steel is the support structure for the mountain, and the brown steel is the support structure for the track. 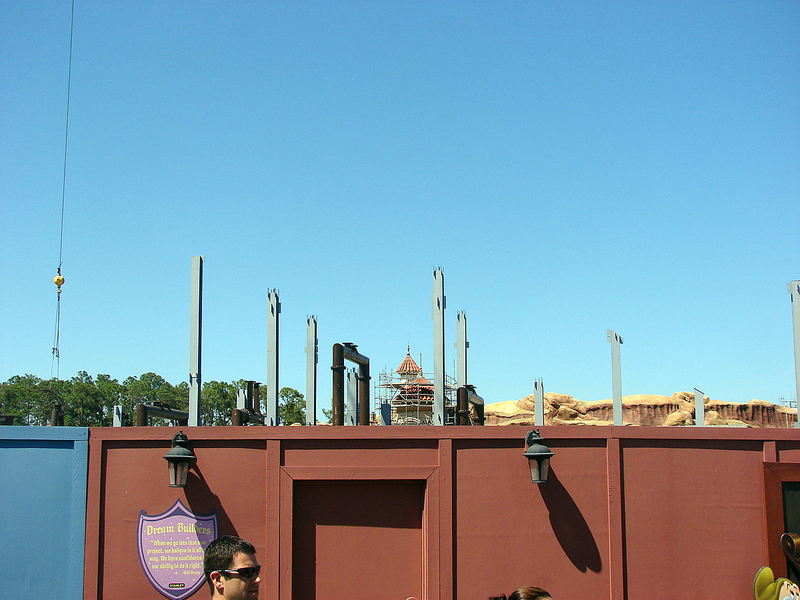 You can see how the mountain will block the sightlines to force discovery as you round a corner. Photo by Mark Goldhaber. Mark also got Chris to talk a little about the Lumiere animatronic that is part of the Enchanted Tales with Belle attraction. Mark first discussed Lumiere with Imagineering Vice President Eric Jacobson last year. 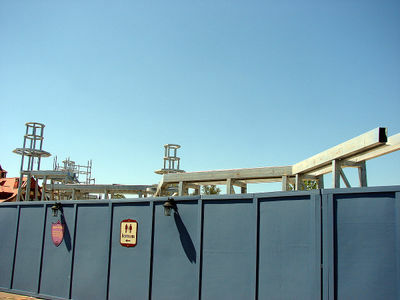 For great photos of the model, check out the ones posted in the WDW Update from last August 25. Mike and Mark talked a while about this, and agreed that this will provide something that has been lacking in the Magic Kingdom. Danielle talked about taking the designs from model rooms through construction to completion. The Imagineers were excited about bringing the movies to life They looked at what aspects we react to and how kids relate to the movies & characters to help decide how to make that into a room. Some of the movies have no furniture in them at all, which makes it hard to translate to a room. In the Finding Nemo-themed rooms, the side chair is coral, while in the Lion King-themed rooms, the chair is a grub. Each bathroom depicts a different scene from that in the room. For the Nemo rooms, the friendly coral reef of the main room gives way to the intervention meeting inside the submarine. Danielle also talked about how suites are filling a need that guests have asked for. Mark and Mike talked about the resort at length, with Mark doing a lot of description of the resort. There are some great images of the resort in the last two WDW Resort Updates. Let us know which what you think of New Fantasyland and the Art of Animation Resort! Nathan Peagler wrote to talk about his family's recent trip to Walt Disney World and to throw out a few topics for Mark and Mike to talk about. A lot of those topics will appear on a future show when there's more time to talk about them. Nathan also said that he prefers the times that Mark and Mike "let your hair down and just talk." We'll try to keep that in mind. John Rodriguez wrote in to say that he doesn't enjoy the interviews on the show and usually fast-forwards through them, despite the fact that he thinks that Mark is an excellent interviewer. John thinks that the show works better when Mark and Mike just talk. "We need more Mark and Mike." We're going to try to spread out the interviews from the press event so that there's plenty of time for us to talk about the interviews on each show. John also wanted to take a minute to rave about the Walt Disney Family Museum. Mark plans to visit the museum the next time he's in the Bay Area, which may (or may not) be later this year. Mike wants to go see the museum as well.